Planning the layout of master bathrooms can be quite easy if you have ideas and knowledge about placing the fixtures. It is always preferable to make priority list before designing large bathroom. Most of the times largest and luxurious bathroom in the house is the master bathroom. It should feature full bath. Intelligent planning of large bathrooms can incorporate comfort and luxury in economical way. Bath tub: The standard dimensions of bath tub is 5ft L x 2.5ft W . The typical shape of the bath tub is rectangular. Jacuzzi: Minimum dimensions for jacuzzi are 3.5 x 4 feet. You can easily find Jacuzzi of 5 x 5 feet or more. Corner Shower enclosure: The standard dimensions of corner shower enclosure is 3 x 3 feet and 6 to 7 feet high. Vanity: The standard dimensions of bath vanity is 1.6 to 2 feet wide and 1.4 to 1.6 feet from front to back. 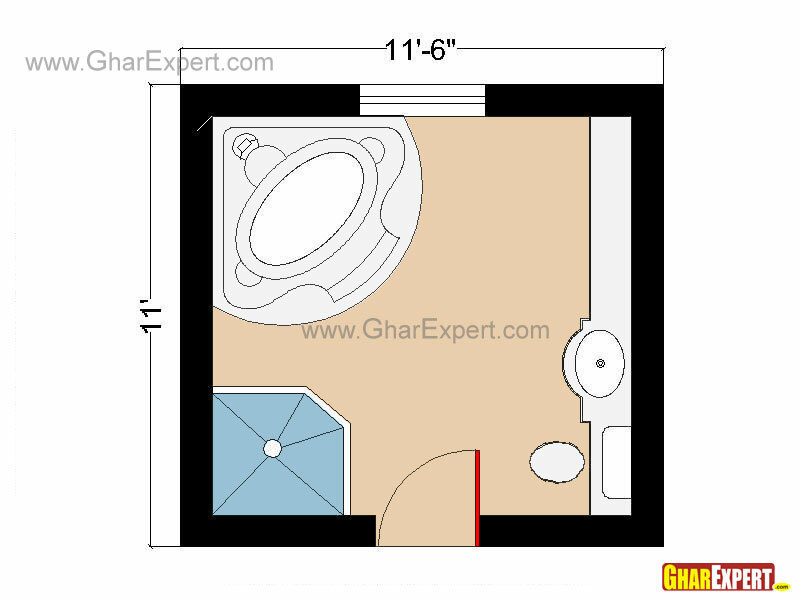 Shower Cubicle: The standard dimensions of shower cubical is 3 x 5 feet. Toilets or WC: The standard seat width used is 1.3 feet. Seat lengths vary from 1.5 to 1.6 feet. Proper toilet seat dimensions should have height of 1.3 or 1.5 feet. Water tank: The width of water tanks is 0.25 meters, making the overall length of a standard water closet from 0.70 to 0.75 meters. 1. Experience a luxurious bathroom plan with private jacuzzi space and corner shower enclosure. Includes sink vanity, toilet, corner shower enclosure with jacuzzi. Privacy wall/ sliding door for comforable jacuzzi bath. 2. Planning of square shape bathroom is little bit difficult. Clever planning of space can minimise your plumbing expenses. Full luxurious bath with sink vanity, toilet and bathtub. Free wall space for cabinets or shower cubicle. 3. Another square shaped bathroom with 19 extra feet. 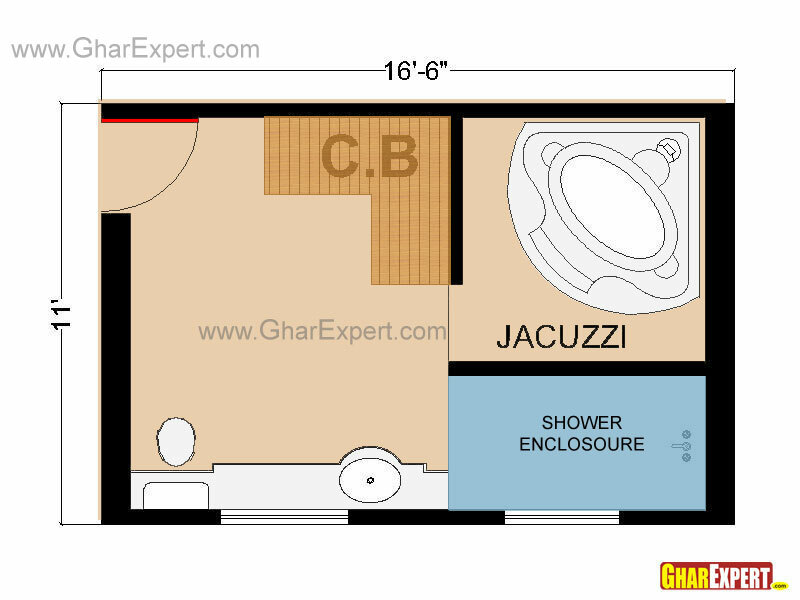 It offers you generous space for jacuzzi and shower enclosure. Full bath with shower enclosure, jacuzzi, vanity, WC and clear area in center. Generous space for large vanity. 4. Twin door layout for master bathroom, makes sharing of bathroom comfortable. 5. Another layout of master bathroom. Intelligent use of privacy walls adds more comfort and luxury to bathroom. Two windows for proper ventilation and lighting. Clear center area for wash off or dry off.